The route to goal finally reopened for Livi as a tremendous solo goal from Danny Mullen inspired a thrilling fightback to secure a point against Queen of the South at the Energy Assets Arena. The Lions hadn’t found the net on league duty since the 4-0 win over Alloa on 13 September, suffering four straight defeats before Tuesday night’s 0-0 draw at Falkirk, and they seemed destined for a sixth match without a goal as the visitors surged into a two-goal lead but, against all the odds, Livi rose from the canvas to mount a stunning comeback in the final ten minutes and salvage a point which maintained their unbeaten record against Queens so far this season. It was the visitors who made the brighter start and had the first chance of the game on six minutes when Chris Higgins got on the end of a decent free kick but could only head over the bar. Livi then went down the other end and Burton O’Brien sent Jordan White in down the right but his cross was overhit and Queens cleared. Michael McKenna then tried his luck from distance for the Lions but his awkward volley drifted over the bar before Keaghan Jacobs passed up the best chance of the match as he drove forward but and fired in a low left foot effort which fizzed just wide. Just as Livi were building up a head of steam they were hit with a sucker-punch as the visitors took the lead as Craig Sives completely mishit a clearance straight to Iain Russell who fed Daniel Carmichael and, when the midfielder’s shot looped into the air off a defender, the ex-Livi striker was first to react to nod the loose ball home. Queens were visibly lifted by the goal and were soon on the attack again, with John Baird screaming for a penalty after going down quite easily in the box. Referee Kevin Graham was on the spot to wave his claims away. Baird was involved again soon after, whipping in a dangerous cross from the left for Gavin Reilly, whose flick-on was well blocked. Livi were indebted to goalkeeper Darren Jamieson on the stroke of half-time as he made a great save to deny Russell and ensure the Lions went in at the break just the one goal down. After starting the first half brightly, Livi repeated the trick as the second half got underway, almost forcing an equaliser on 53 minutes as O’Brien fed Gary Glen but his shot was well saved by Zander Clark in the Queens goal. From the resulting corner, the ball fell to Sives but his close range effort was blocked before the danger was cleared. The pressure continued from Livi and a fine cross from Callum Fordyce found White at the far post but his header flew wide. The Lions were screaming for a penalty soon after as White’s effort struck the arm of a Queens defender. His arm was well away from his body but referee Graham saw fit not to point to the spot. The pattern of the first half was repeated again as, having enjoyed the better of the half, Livi were once more stung on the counter as Queens doubled their lead midway through the half when a fine curling cross found Reilly six yards out and he planted his header into the corner of the net to make it 2-0. 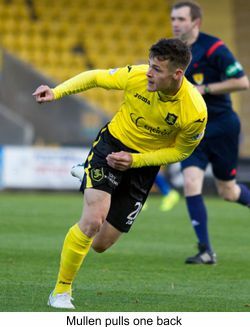 Livi boss John McGlynn responded to the loss of the second goal by sending on Danny Mullen in place of Shaun Rutherford and it proved an inspired switch as, within six minutes, he produced a sparkling solo goal, jinking through the Queens defence before smashing a controlled effort high into the net. It was game on once again with nine minutes to go, thoughsome among the home support felt the need to leave early despite their team having just pulled one goal back and pressing forward in search of a second. Those fans were left to rue their decision as the Lions snatched an unlikely leveller with just two minutes to go. A long throw from sub Myles Hippolyte deceived everyone in the Queens box, bounced through to the unmarked Glen at the far post, and the ex-Hearts man forced the ball beyond Clark and into the net to rescue an improbable point. So the search for a win goes on, stretching now to eight matches in all competitions (excluding penalty shootouts), but the players deserve great credit for their stirring fightback. Given the poor recent run it would have been easy for their heads to go down as Queens went 2-0 up but they showed great character to roar back and salvage a point, and will head south to Annan for next week’s Scottish Cup Third Round tie with some confidence restored.